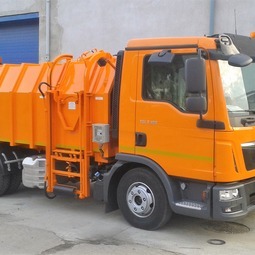 We are pleased to announce the delivery of garbage trucks with side-loading - SMYK. 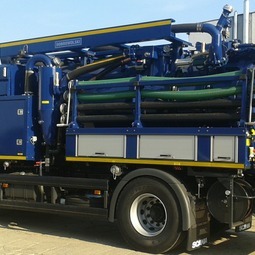 Product DOBROWOLSKI would take care of the cleanliness of one of the German cities. Dear customers! 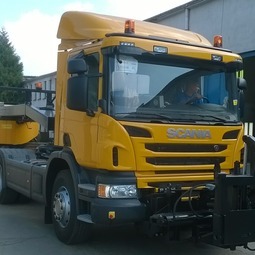 We are pleased to announce that the next equipment leaves our company. 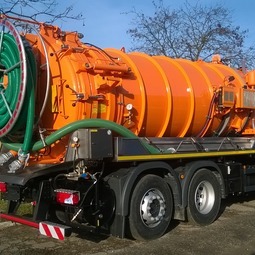 The septic tanker this time goes on the german market. The tank with a capacity of 14 m 3, the hose on the rear reel. Feel free to contact, we are pleased to answer any questions. 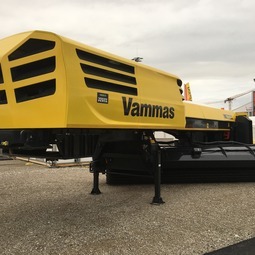 We completed the production of sweeper blower SB 3600. The product brand DOBROWOLSKI will maintain the purity of the plate on one of the airports in Armenia. Dobrowolski Ltd Dobrowolski once again appreciated. Bisnode Poland international business intelligence awarded our company, handing the Certificate of Business Credibility. 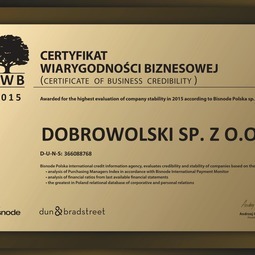 Therefore we found ourselves in a group of companies with the highest stability in Poland in 2015.